There have been few instances in the past when a dethroned No. 1 went as hard as Novak Djokovic has during the fall season to show the world that’s he really still the best player in the game. As the Serbian says, now No.1 Rafael Nadal deserves the top spot after his tremendous year, especially because he bested Djokovic in two Slams, Roland Garros and the US Open. But this fall season has been all about Djokovic tapping into his enormous mental reserve, tweaking a few parts of his game and going right at the Spaniard, beating him in Beijing and the ATP World Finals. He was on a 22-match winning streak headed into the Davis Cup final, courtesy of an improved net game, clutch serving and a more consistent forehand. Yes, Nadal was a little mentally down during the fall stretch and wasn’t his normal self in London, but he was out played after a solid week indoors and it sure looks like Djokovic believes that he still has the goods to take him down on a consistent basis off of clay. Nadal says that he thinks he’ll have a better shot at home in Australia and he should believe that given he’s won their last two outdoor hard court clashes (Montreal and the US Open) but if he’s to best him Down Under he is going to have to amp up his service speed again, have faith in his forehand down the line as well as his inside out forehand and perhaps in the offseason, improve his backhand down the line, the weakest part of his game. Outside of Andy Murray‘s amazing run at Wimbledon and his fine play in winning Miami, this season has been all about Nadal and Djokovic. No other players really mattered. They combined to win three out of the four Grand Slams and all of the Masters Series titles except Miami. A healthy Murray would have had a lot to say about who was winning tournaments post Wimbledon, but his bad back got the better of him and now he has to prove post-surgery that he can still keep up with Nadal and Djokovic. In great health, he can, but it’s hard to think of any great tennis players who have returned from back surgery at the same level. Back surgeries have become more effective over the past 20 years or so it’s possible that Murray will come back at his Wimbledon winning level, but it is doubtful that the tennis world will see that right off the bat, so his chances of having major effect on the Australian Open are slim. What that means is that there is a strong chance that Nadal and Djokovic will face off for the 40th time in the Aussie Open final. Will they play for almost six hours again like they did back in 2011? Perhaps not, but with the way that they match up they will surely grind it out for three hours minimum. Can any other male player stop what appears to be the ATP’s inevitable final? No one really did at the O2 Arena in London. Sure, Juan Martin Del Potro has showed that in two out of three sets matches that he can play anyone tough and even beat them on occasion but in three out five sets he hasn’t shown that since his return from wrist surgery in 2010. His serve and forehand are very effective weapons, but his backhand is relatively weak, his transition game is spotty, he doesn’t return all that well and even though he’s the best mover of any of the very tall competitors, he can’t run with the Big 4. Speaking of whom, the Swiss played very at times during the ATP World Tour Finals, but he was also sloppy at times and that really costs him in his semifinal loss to Nadal. After the Spaniard’s tight straight set win, it sounded like Nadal described Federer’s play as “crazy” but he apparently said “aggressive” and noted that Federer had been effective against him in the past in London by going for winners off of every shot. While that strategy may have worked against Nadal a few years ago and might work one out of 10 times for Federer now against the man who is putting his GOAT status at serious risk, it’s just too hard for a 32 year old to pull that off when he’s lost a little speed and timing. Federer has to be more measured in his approach, like he was against Del Potro and to a degree in his opening three-set loss to Djokovic. Perhaps most importantly though is that in the off season and next year he has to open his mind up to change. He did not have a great season around the net, but he’s certainly capable of becoming a great volleyer and if he does not commit to charging ahead more and taking over matches at the cords then he’s not going to win a another Slam. His days of being able to consistently beat Djokovic, Nadal and Murray on anything but a very quick surface are gone. But a Federer 3.0 who can rush his foes and put away tough volleys? That Roger can win another major in 2014. Regarding the other four men who played in London, the only one who really impressive was Stanislas Wawrinka, who displayed top 5 material at the tournament and for parts of the 2013. He has a terrific serve and backhand, and his forehand can be pretty effective when he’s on. He’s not bad at closing points at the net, but he doesn’t return that well and is still lacking that little bit of self-confidence that would have him actually upsetting a Djokovic or Nadal on occasion rather than constantly losing to them. 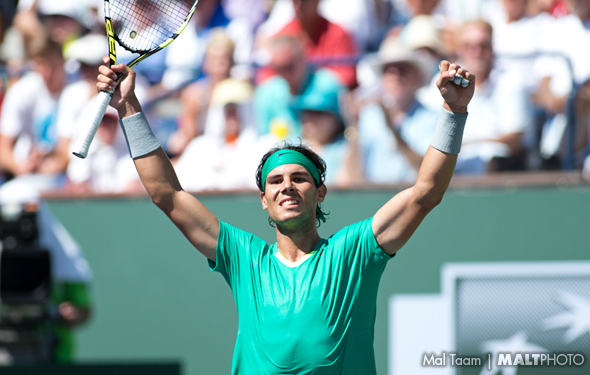 If he can find a way to gain a little more belief in 2014, he may find himself back in Slam semi once again. Of the other three men who competed there – David Ferrer, Tomas Berdych and Richard Gasquet – only the Czech showed off a very high level on occasion, but it also appeared that his mind was more on the Davis Cup final. Ferrer was exhausted after a long fall campaign and was underwhelming. Gasquet is quite a shotmaker, but he’s too erratic to take down the top guys and he’s no without a head coach as Riccardo Piatti has left him. Hopefully next year one of the so called up and comers such as Milos Raonic and Grigor Dimitrov will make it into the final and add a little more flavor the competition.